They say the key to a great steak is a great crust. And the key to a great crust is lots of high, direct heat. And the key to lots of high, direct heat? A stream of flowing lava, of course. It seems like heresy, especially in the height of grilling season and particularly the day after Independence Day weekend, but if you want to make truly amazing burgers at home, don't ever let them touch the grill. With grilling season in full swing, it's time to head to the butcher shop, see what looks awesome, and build those fires. And while the flavor and luxury of beef is relatively straightforward, buying the right cut for grilling, and cooking it to perfection actually isn't. Steak is expensive, and anyone who's tried to cook a too-thin cut or one with too much connective tissue only to cut into a dry, chewy mess can tell you: you gotta know what you're doing, which means knowing what you're buying. Some argue that bacon is a trick: anything tastes that much more delicious when you put bacon on top of it. But a bacon cheeseburger isn't just a cheeseburger with bacon on it...at least, it shouldn't be. The additional salt and smoke and texture call for changing the your whole burger strategy, finding a way to highlight the bacon rather than just waste inside all the standard toppings. "Sear the meat to lock in the juices." "Only flip your steak one time." And so goes a list of steak-cooking commandments... And, as you might guess, a whole bunch of them are just wrong. The image you're looking at is of a cupcake-sausage, grilled and served on a "long john" doughnut bun and a rasperry topping ketchup. Yeah, I know. The idea of grilling vegetables isn't new. 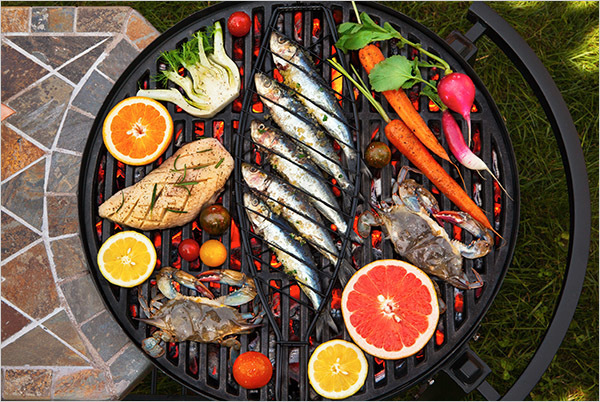 Everyone who does outdoor cooking knows those hot grates are a perfect space to heat and char up some sides to go with that main course, or that some Tuscan grilled veggies, a bit of cheese, and a loaf of bread makes a perfect summer meal for two. But what about taking grilled veggies seriously, opting for thick, meaty cuts that make you forget about grilled meats altogether? Every state in the U.S. is covered in snow, except for poor Florida. Many are saying, "Snow? of course, it's January," while others totally freak out, cancel schools, close down roads, and populations go into hibernation. But for my money, it gives me an excuse to start cooking. I love to spend winter nights trying new things; complex dishes that come out of the lack of amazing produce you wouldn't want to otherwise mask. If you simply don't over- or undercook you food, and you do your best to keep things from catching on fire, you can make some perfectly acceptable grilled food (it is really amazing how far char, salt, and pepper can go). But, acceptable is just that; we want amazing food on the grill. And that, my friends, means embracing the world of dry and wet rubs. With July 4th on tap for this weekend, we're so deep into grilling season our tongs barely have time to cool down between uses. Gratefully (ha! ), Mark Bittman has assembled a massive collection of grilling recipes that can be prepared super quickly, with "vast majority [taking] less time to prepare and grill than it takes to watch your coals turn white. [Or] If you use gas, they’re still almost as fast as heating up the grill..."
Bittman begins with veggies and fruit, moves through meat, nails fish and shellfish, kills kebab, slays salads, bangs out burgers, sandwiches, and breads, and comes to a close where any meal should - with dessert. With Memorial Day behind us, it's OFFICIALLY grilling season, and nothing tastes like summer more than a well-formed, well-seasoned, and well-grilled hamburger. Many purists would argue that ground beef, salt, pepper are all that should ever go into a burger, but with some many resources, techniques, and traditions available to us, why not supplement that classic juicy beef patty with a few new options? Especially some that are so flavorful, you can keep the ketchup bottle in the fridge.